If you have trouble to get a connection to your windows mobile or windows ce device, here (archived copy) is a great article about how to repair the connection. I recently had such trouble. WMDC only showed an Error symbol. The log file vminst.log showed many “inst : 09/05/13 10:00:27 E1:AdjustSecurity: security query failed: 0x80004002 0x00000000” error lines. Looking for the meaning of this error, I found 0x80004002 is related to outlook. This is erratic, as I do not sync email or other stuff with these development devices, I use the GuestOnly registry setting to avoid to create a partnership with all the devices around my developer desk. But outlook was also mentioned as possibly cause for WMDC problems and so I changed to my outlook dir and run scanpst.exe on my outlook pst file. And, o wonder, the WMDC connection did work after the repair (there were errors in my pst file). In an earlier post I wrote about a tool to autohide the annoying WMDC window. As a developer I dont like to keep WMDC come up every time I connect a device. I just need to know, if the device is connected or not. Fortunately, Henkie leaved a comment about a usefull alternative for WMDC. But as commented here, no visual control of the connection. Now I started to think about a small tool to have a visual control of WMDC connected or not. I had to use RAPI either provided by MS or via OpenNetCF.Desktop.Communication. Although the OpenNETCF one works OK, I was not satisfied, as it was impossible to get a connection status without disconnect/connect. 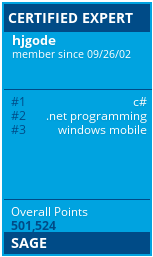 So I went back to WIN32 API and wrote this small tool based on DeviceInfo sample of Windows Mobile 6 SDK. First I again messed up with notification icons in Windows 7 (64bit). But the icon may be removed or not, depending on Windows 7 decisions I dont know. So the tool uses a simple window and an icon to let you know the connection status. Just start the tool and the icon and edit window background will show, if device is connected or not. The application icon in the title bar as in the taskbar button will change from gray to color for a connected versa a disconnected device.